The naira on Tuesday appreciated against the dollar at the parallel market after a one-week depreciation. 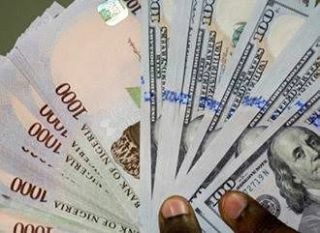 The naira traded between N380 (buying), and N390 (selling) stronger than N395 recorded on Monday, while the Pound Sterling and the Euro closed at N480 and N415 respectively. At the Bureau De Change (BDC), the naira was sold at N362 to the dollar, while the Pound Sterling and the Euro closed at N483 and N430 respectively. Trading at the interbank market saw the naira closed at N306.25. Traders at the market said that the intervention by the Central Bank of Nigeria (CBN) at the different segments of the foreign exchange market was driving the strengthening of the naira against the dollar. Meanwhile, Alhaji Aminu Gwadabe, the President, Association of Bureau De Change Operators of Nigeria (ABCON) had predicted the appreciation of the naira as BDCs set to receive more Diaspora remittances.